An MSF nurse prepares to distrubute the drugs to TB patients. 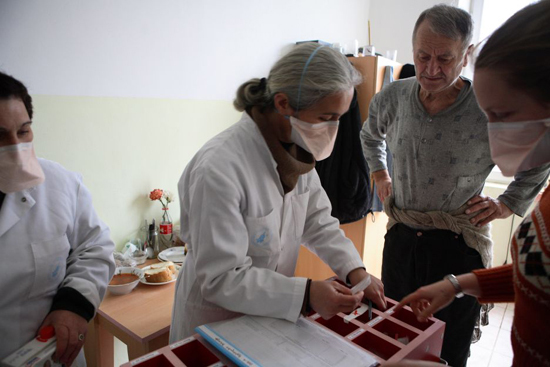 In Zugdidi, Georgia, nine patients suffering from resistant forms of tuberculosis (TB) have completed their treatment after two years of adhering to a daily drug regimen. Jocelyne Madrilène, Doctors Without Borders/Médecins Sans Frontières (MSF) head of mission in Zugdidi, explains why these recoveries are satisfying for the patients and the entire medical staff. 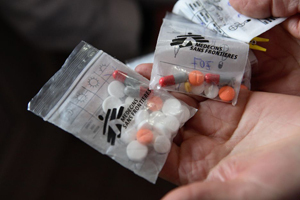 When MSF began treating patients with drug-resistant forms of TB in Georgia's Samagrelo region in November 2006, it was the only medical organization providing this service in Georgia. Since then, the country’s Ministry of Health has opened two additional programs. One of the biggest challenges of treating drug-resistant forms of TB is the length of treatment that is required. In June 2008, after 20 months of treatment, the first patient completed his drug regimen at MSF’s Zugdidi project. However he is not considered to be cured, since there is the possibility of a relapse. Officially, a patient can be declared cured two years after the end of treatment. The daily drug regimen for these patients. “These first recoveries are very satisfying for the 93 patients currently undergoing treatment, and also for all the medical staff,” Madrilène says. “For doctors, nurses and all staff, it's a daily struggle to ensure that patients retain the strength to continue their treatment. The first patients healed live in Zugdidi, therefore they have been coming in quite frequently to the hospital to visit in-patients. They give them tips on how to stay the course, and emphasize the need to continue fighting the illness." In Zugdidi, 153 patients have been admitted into the program over the last two years. In that time, 14 patients have died, representing approximately ten percent of all patients. This death rate is far lower than those of many other drug-resistant TB programs. In many cases, up to half the patients will interrupt treatment for reasons including side-effects from the highly toxic drugs, and long distances they might have to travel in order to receive supervised treatment. Not adhering to treatment can lead to further drug resistance, potentially resulting in extensively drug-resistant TB (XDR-TB). TB in its resistant forms is deadly and particularly difficult to treat, due to a critical lack of rapid diagnostic tests, as well as effective treatments. A TB patient in his room at the hospital about to receive his drug regimen. An essential factor in ensuring that patients adhere to treatment is the social and economic support provided by MSF and Georgia's national TB program. Often isolated and unable to work, patients need daily support: firewood and clothes in winter; proper nutrition; and travel costs. "Thirty percent of our patients live below the poverty line. If we didn't help them, they would not follow their treatment correctly and a certain number of them would probably prefer to quit," Madrilène says. Once patients return home and continue their treatment as outpatients, MSF rehabilitates their homes in order to remove the risks of transmitting the illness to others. These measures, combined with follow-ups for each patient, are essential factors in preventing treatment interruptions or program drop-outs. In August 2008, the war between Georgia and Russia led to severe concerns regarding the follow-up of patient treatments. However, while the Zugdidi region was bombarded, two-thirds of the patients continued to take their treatment daily, which for some meant getting to the nearest treatment station from their homes. Throughout 2008, the Zugdidi program witnessed an intense admission rate of six or seven patients a month. The trend is expected to continue over the coming months. However, by the end of March, around 10 more patients are expected to complete their treatment.